A field experiment was conducted during rainy seasons of 2008 and 2009 on clay loam soil of Bundi to evaluate performance of soybean genotypes. Two hand-weeding at 20 and 35 DAS recorded significantly higher filled pods/plant(41.90), seeds/pod(3.33),seed index(12.20 g), seed yield (14.85 q/ha) and return (Rs 24,460/ha) over farmer's practice followed by 1 kulpa at 20 DAS+ 1 HW at 35 DAS and application of Imazethapyr 75 g/ha at 15 DAS+ 1HW at 35 DAS. The highest benefit:cost ratio (1.72) was obtained with 1 kulpa at 20 DAS+ 1HW at 35 DAS. Significantly lower weed density (40.70/m2), weed dry weight (366.30 kg/ha) at harvest and highest weed control efficiency (56.78%) were obtained with use of Imazethapyr 75 g/ha at 15 DAS+ 1HW at 35 DAS over rest of treatment. Among soybean genotype, JS-95-60 significantly gave higher seeds/pod (3.38), 100-seed weight (13.25 g), seed yield (15.90 q/ha), return (Rs 26,140/ha) and B: c ratio (2.12) over farmer's practice and was on par with JS-93-05. Hence, it is concluded that soybean genotype JS-95-60 with use of either one kulpa at 20 DAS+ 1HW at 35 DAS or two HW at 20 and 35 DAS provide higher yield and benefit under rainfed situations. Imazethapyr, Soybean,weed Control Efficiency, Weed Management, Yield. Chaturvedi,S.,Chandel,A.S.,Dhyani,V.C.and Singh,A.P. (2010). Productivity, profitability and quality of soybean (Glycine max) and residual soil fertility as influenced by integrated nutrient management. Indian.J. Agronomy 55 : 133-137. Jha, Dilip Kumar. (2010). Soybean yield set to hit all-time high.http://www.business-standard. com/india/ printpage.php?autono= 41. Kuchlan, P, Husain, S. M. and Chauhan, G. S. (2010). 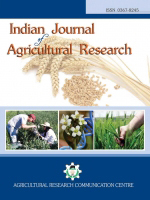 Evaluation of soybean (Glycine max) genotypes for seed longevity.Indian Jouranal of Agricultural Sciences 80 (2):141- 145. KDR, Krishi Digdarshika-Rajasthan (Fourth Ed.).(2011). Vishv Krishi Sanchar,Kota, Rajasthan.11p. Kushwah, S. S. and Vyas, M .D. (2005).Herbicidal weed-control in soybean (Glycine max.). Indian. J.Agron., 50: 225-227. Masihat Ali. (2009).Performance of early maturing soybean varieties in humid south- eastern plain zone-V.In:proceeding Kharif ZREACmeeting on Kharif Results-2009, held at ARS,Kota, Rajasthan during 16-17 March. Suresh, G. and Reddy, B. N. (2010). Effect of weed control practices on weed dry matter, production potential and nutrient uptake of sunflower (Helianthus annuus) in Vertisols. Indian Journal of Agricultural Sciences, 80(1):33-37.